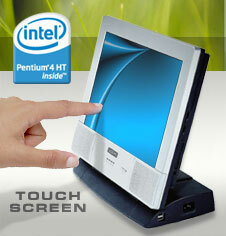 Perfect small form-factor, lightweight, All-in-One TouchSystem PC with 5-wire resistive touch screen glass controller. Meets all Retail Hardening requirements with long lifespan and long term support of 7-10 years. EUROCOM LP29xTP 5-wire resistive technology is the workhorse of resistive touchscreens, providing unsurpassed performance. When activated with a finger, gloved hand, fingernail, or object such as a credit card, the touchscreen delivers a fast, accurate response every time. It is impervious to environmental conditions such as liquid spills and splashes, humidity, and washdown the most contamination-resistant touchscreen available.